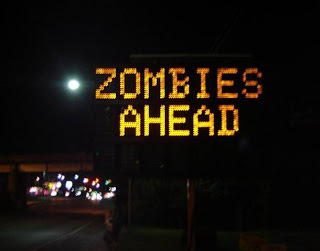 Over the past several days, hackers across the country have been altering the messages on digital traffic warning signs to read "Zombies Ahead! Run for Your Lives!" and other warnings of a zombie apocalypse. As a zombie fan and a reader of "The Zombie Survival Guide" I find this to be highly amusing. You can watch the news story here. Oh yeah - it's funny now, but what happens when real flesh eating un-dead monsters run riot across America? Have they never heard of the boy who cried wolf!? Have you ever seen 28 Days Later? - triumph of modern UK cinema and one of few horror films that actually frighten you. Yes I have. I love the world of the zombie movie, especialy those that break from the norm. Have you seen Shaun of the Dead? That added some humor to the mix. For some truly twisted zombie movies off the beaten path, check out Cemetery Man, I Zombie, and Shatter Dead, if you haven't seen them already. Oh. And FIDO. That's a great one. It explores the whole concept of making zombies pets. Must be seen to be believed. OK, FIDO is going on the top of my DVD rental list - I'm a long standing Connolly fan, in fact Billy Connolly is cited as a reference more than the Bible in our house - I'm always willing to watch something with him in it - and PET ZOMBIES? How could that not be BRILLIANT?